Do you love roses? I do. 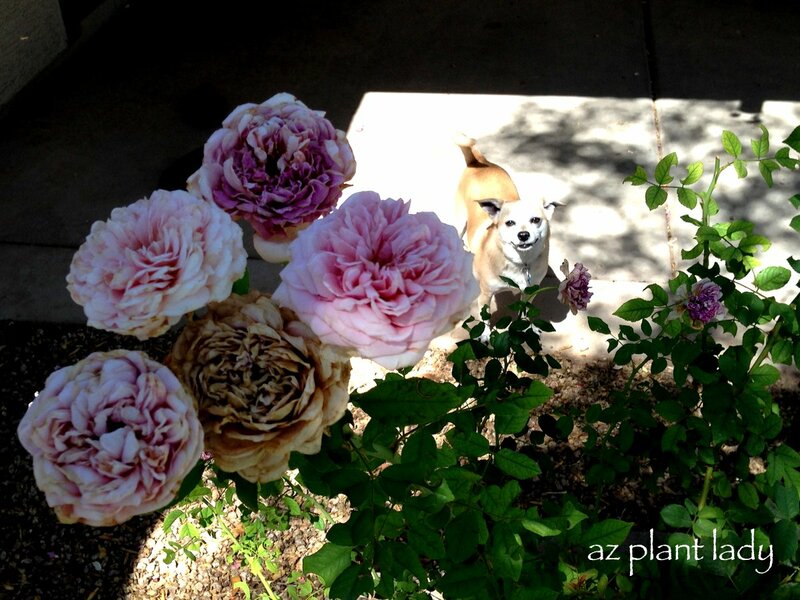 I used to have 40 roses in my Phoenix garden – I must admit that I went a little overboard. Although my passion has steered toward using drought tolerant trees and plants to add beauty to the landscape, I still have a special place in my heart for roses. So, whenever I am on the road and a rose garden is nearby, I always take some time to “walk through the roses”. Back in 2001, we took a trip to Ireland. This was when we had two kids and not five (we adopted three children from China a few years later). Of course when traveling in Europe, castles are always on the ‘must-see’ list. While visiting the city of Kilkenny, we decided to make a stop at Kilkenny Castle. The problem was, was that all of Ireland and Great Britain was under quarantine conditions at many of the tourist attractions due to ‘foot and mouth’ disease, which was highly contagious and speading to livestock. So, much of our trip was spent looking from the outside in. Fast forward 2 years later and we found ourselves in Kilkenny again and we were thrilled that there were no restrictions. My husband was anxious to go on the tour of the inside of the castle, but the problem was, was that I couldn’t tear myself away from the rose gardens surrounding the castle. It was June and the roses smelled heavenly and were so beautiful. Whenever I find myself on a large estate or castle (which isn’t all that often), I like to dream of what I would do with the gardens. In this case, I would probably tear up more grass and add more roses! I look cranky in this photo, but I blame it on the jet lag from arriving in Ireland the day before. After spending an hour touring the grounds, we did make it indoors for the tour, which was very interesting – I like history too! The next day was spent touring the surrounding countryside, but in the afternoon, we found ourselves drawn to the rose garden again and sat on the benches reading. I can’t think of a better way to spend an afternoon, do you? For more information on roses and how to grow them in the desert, I have listed several blog posts that will help that you can access, here. https://www.azplantlady.com/wp-content/uploads/2014/09/azplantladyroses-001-1.jpg 1200 797 arizonaplantlady@gmail.com http://www.azplantlady.com/wp-content/uploads/2018/10/favicon.png arizonaplantlady@gmail.com2014-09-24 12:00:002016-10-26 14:35:44A Rose Garden Garden Fit For a Castle? For those of you who have been reading my blog for awhile, you know that I sometimes write about the goings on in my life. And so I begin the post with fair warning- if you are looking for gardening content – there will be some, but not a lot. Do you ever look back at your calendar for the past month and wonder where the time went? I did just that and was pleasantly surprised to see how much went on. 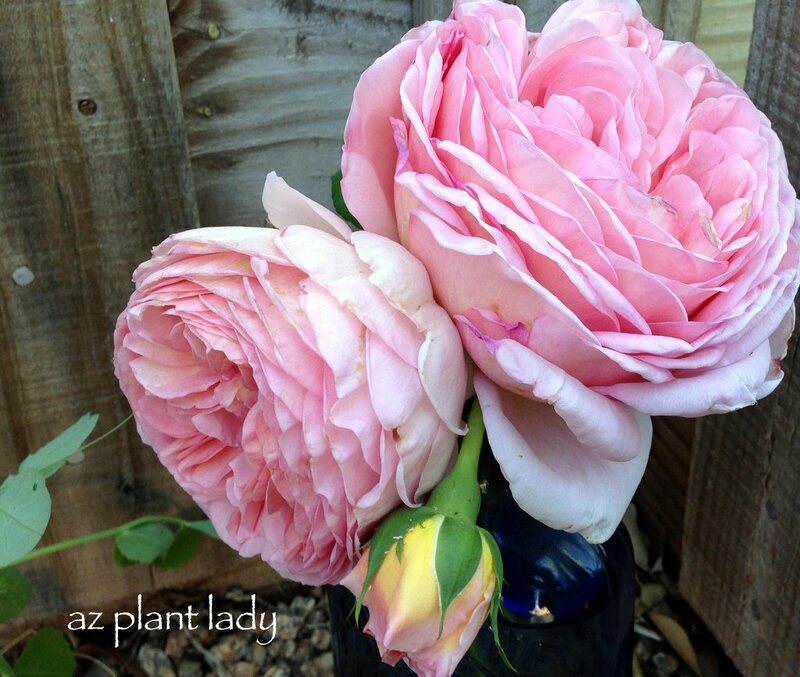 I thought that I’d share with you a small snapshot of the past month in the life of ‘az plant lady’ (me)! The most exciting event was visiting my daughter in California and being there for her ultrasound when she found out that she was having a little boy. I am so excited and can’t wait for January to get here so that I can hold him in my arms! While visiting my daughter, who is in the Navy and stationed in California, we stopped by the small beach town of Carpenteria, which is just south of Santa Barbara. We visited a couple of nurseries in Carpenteria where I discovered a new flowering perennial introduction and enjoyed a very unique experience at another nursery. Santa Barbara Mission and rose garden. We stopped off to visit the beautiful mission of Santa Barbara, which was founded in 1786. I always enjoy visiting the mission, but I must confess that my attention was diverted by the adjoining rose garden that was in full bloom. I’ll share more about my visit to another special rose garden later this week. My husband and I both enjoy visiting this area since we spent time there when we attended Westmont College in Santa Barbara, which is where we met. The college has beautiful grounds and I recently shared some photos of our most recent visit there, which you can see here. Back home, homecoming at our local high school arrived early this year. Our daughter, Ruthie had fun getting ready and had a great time! Earlier in the month, Ruthie took part in the ice-bucket challenge for ALS on behalf of her grandpa who died from this truly horrible disease 3 years ago. Has your husband ever had a dream of owning a certain car or motorcycle? Mine has wanted a Harley Davdison motorcycle for over 9 years. He has stacks of old motorcycle magazines dating back from 2006 that he has kept hidden away in a huge Rubbermaid plastic tub. I am married to someone who is so giving and self-sacrificing and it was so nice to see the joy as his dream was finally realized. He has been walking around with a smile on his face for weeks now and he looks forward to driving to and from work on his new bike. Surprisingly, my granddaughter, Lily, has been quite taken with her papa’s new motorcycle and asks to see “the Harley Davidson” when she visits. It is really kind of funny since her parents aren’t into motorcycles at all. But, she adores her papa and his new bike. While at our local Harley Davidson dealer, my husband saw kid tattoos and picked up one for her that had a scorpion on it. Lily likes to wear little tattoos of Minnie Mouse or other cartoon characters, but I was shocked when she wanted to wear the one her papa bought her with a scorpion on it. Two weeks ago, we received record-breaking 5 1/2 of rainfall within a few hours time!!! My husband had to delay going to work in order to sweep water off of the patio to keep our house from flooding. When he did finally get on the road to get to work, it took 30 minutes to drive 4 miles! The garden loved the rain and now all the weeds are beginning to come up, so I’ll mix up a batch of my homemade weed killer. So what will the coming month bring? Right now, I’m busy designing landscape for four different areas on a golf course, where they are removing large areas of turf, in favor of a drought tolerant landscape. My dining room table has been taken over by large sheets of vellum (what I draw my designs on), drafting supplies and the like. I tend to get involved in creating designs this way and can easily spend an entire day in my own little world. This month also brings another first for us. My husband and I are both alumni of Arizona State University and have season tickets this year. We are so excited and hopefully, our team will do well this year. Next week, we will be adding a new member to our family. We recently said “goodbye” to our 15 year-old golden retriever and decided to welcome a new dog into our lives. Although Polly is not ready to come live with us yet, we were able to visit her and her litter mates. Well, that is a snapshot of the past month and some of what will be happening soon. Thank you for taking a little time out of your day and allowing me to share a little of my life. The past couple of days on the road have been both eventful AND uneventful. Yesterday morning found us in Columbia, SC. We set on our way to find a folk art festival that was scheduled near the campus of University of South Carolina (USC), but couldn’t find it. What we did find, driving through the campus, was a community garden, a rose garden and beautiful perennial beds along the roadside. We parked near the university book store in the only spot we could find – we had only 30 minutes to explore or else we could get a ticket. These perennial beds were filled with vegetables like artichoke and swiss chard, which look great as ornamentals alongside the pansies, dianthus and lamb’s ears. Pink and coral poppies were in full bloom. The red poppies in my garden at home were just beginning to fade before I left. The campus of USC also has historical significance during the Civil War, where the parade grounds and barracks were located. As we continued our walk, I kept seeing more things that got me excited. As we turned the corner, we found ourselves in a small rose garden. Isn’t this Peace rose, pretty? It was raining lightly as you can see. This climbing rose used a nearby tree as a support. I have grown many different kinds of roses, but never climbing roses. Maybe I should try? Being from a dry climate, I am fascinated in observing the differences in gardens of wetter climates. Okay, I know that those of you who live in more humid climates may be rolling your eyes at this point when you look at the photo, above. But, I thought these ferns looked just beautiful growing out from the brick wall. I am also always interested in seeing familiar plants, adapted to dry climates, being represented in other areas, like the Yucca, below. We came upon the largest agave that I have seen, which is saying something because I see a LOT of agave. I was having a great time and looking at my watch, realized that we had to start heading back to our car so we wouldn’t get a ticket. But then, we came upon this community garden. These raised beds were filled with delicious vegetables. Next to the raised beds, was a garden with herbs, including these flowering broccoli. The separate beds were divided, not with boxwood hedges, but rosemary. I really liked how it looked. At the back wall of the herb garden, stood a ‘tipsy-topsy’ planter. There was a different herb in each pot – chives, cilantro, basil, oregano and rosemary. As the clock was ticking and we didn’t have any time to spare, we walked by this beautiful bed of flowers, containing one of my favorite plants – Autumn Sage (Salvia greggii). USC has a beautiful campus and I was so happy to have to found such an unexpected garden ‘jewel’. After leaving USC, we decided to visit the Confederate Museum in Columbia. You see, my mother and I love to learn about history and that entails visiting museums and historical sights. I am both a product of both the North and the South in regards to my ancestry. It was time to leave Columbia for our next destination. *The community garden was so wonderful that I will need to feature it in an upcoming post. **Tipsy-topsy pots are very popular right now and aren’t hard to make. I found a tutorial that you can click on here. Do you have peppers growing in your garden? Sure, my bell pepper plants are beautiful. But, I don’t have any peppers growing on them. Yes, I’m talking about Epsom salt. Some of you may have already heard about the benefits of Epsom salts in the garden. Epsom salts are made up of magnesium sulfate, which is a nutrient that plants like to have, especially if your soil is deficient. If you want me to get ‘scientific’ on you magnesium strengthens cell walls, aids in photosynthesis = dark green leaves, helps seeds to germinate and can help flowers, fruit and/or vegetables to form. And so, I applied 2 tablespoons around each of my pepper plants and watered it in. Some gardeners like to create a spray out of Epsom salt and water and spray on the leaves, but it is too hot in the summer to do this – the leaves will burn. I can’t wait to see the results. I am hoping for lots of peppers. I’ll keep you posted! 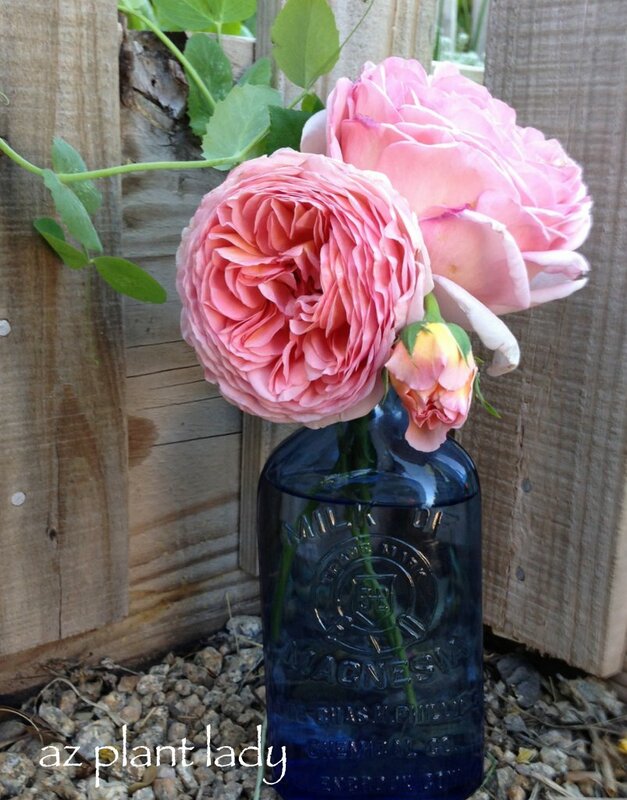 *Roses also love Epsom salts – apply 1/2 a cup around the base of each of your roses. I have a couple of delicious recipes already posted and many more already written, ready to post. https://www.azplantlady.com/wp-content/uploads/2012/08/Bell-pepper-plant.jpg 640 480 arizonaplantlady@gmail.com http://www.azplantlady.com/wp-content/uploads/2018/10/favicon.png arizonaplantlady@gmail.com2012-08-15 18:41:002016-10-26 14:36:22Got Peppers? Graham Thomas, Abraham Darby, and Falstaff David Austin shrub roses. In fact, at one time – I had 40 rose bushes growing in my garden in our first house. I lovingly tended them and was rewarded with gorgeous blooms. Years later, I don’t have quite as many roses in my current garden, but I love growing them just as much as I did years ago. Because we grow roses for their beautiful blooms, I learned some tips from rose-growing experts on how to maximize blooms and the health of my rose bushes. So, I’m going to share them with you. *Basic rose care consists of fertilizing your roses in spring, using a fertilizer specially formulated for roses. You can do this and have a lovely rose bush. However, if you want the biggest and most floriferous rose bushes in your neighborhood, you’ll want to follow these tips. 1. In spring, grab your broom (yes, I said a broom) and make six holes around each rose bush (about 1 ft. from the base). Each hole should be 6 – 8 inches deep. 2. For this next step, you will need 6 cups of compost, 3 cups of composted steer (or chicken or horse) manure, 1/2 cup of Epsom salts, the recommended amount of your favorite rose fertilizer and two handfuls of alfalfa pellets per rose bush. So how do these ingredients help your roses? – The compost improves your soil by adding fertility, increasing its ability to hold the right amount of water and feeds microorganisms in the soil. – Using manure adds a natural source of nitrogen that is slowly released into the soil. Make sure the manure is composted (aged) before using, or it can ‘burn’ your roses. – Head to your nearest feed store and pick up some alfalfa pellets. When alfalfa breaks down in the soil, it releases an alcohol (triacontanol) that roses love. They respond to it by growing more branches (basal breaks) from the bud union AND increases the number of roses and their size. 3. Mix all the ingredients together and then pour the mixture into each of the holes. Work any extra mixture into the top inch of soil around your roses. By adding the mixture into the holes, you are putting them right where the roots are. 4. Water deeply to 18 inches. That’s it! Follow these tips, and your roses will soon be the envy of all your neighbors. But, I’m not finished yet…. 5. 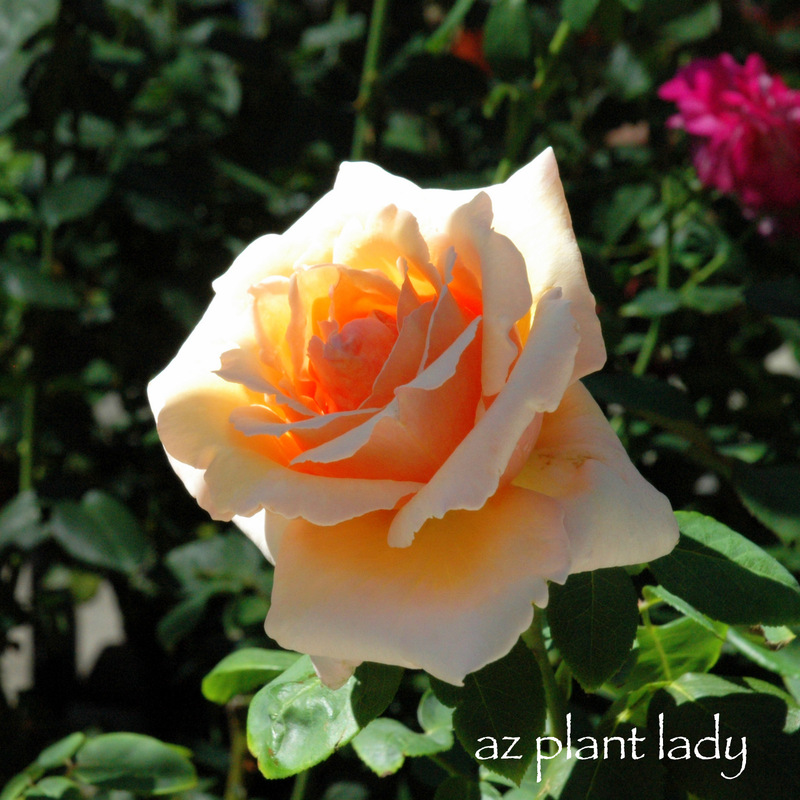 Add liquid fertilizer to your roses monthly during the growing season. **In hot, dry desert climates – your roses will slow down their growth during the heat of summer because it is hard for them to focus on growth when it is hot. Apply liquid fertilizer at 1/2 strength once a month beginning in May and lasting through August. In September begin your regular fertilizer schedule for beautiful, fall roses. Do you know what the definition of the word ‘conundrum’ is? I do. Actually, I had to look it up – but it basically means a “difficult situation”. That sums up what I am facing in my back garden. First, there is my wonderful husband…. The second part is the nest box that my husband made to attract leaf-cutter bees. As you can see, there are already some occupants in some of the larger holes. You may be wondering why my husband is trying to attract leaf-cutter bees. Well, he has recently become interested in beekeeping and is considering raising honeybees someday. In the meantime, he decided that he would try to attract leaf-cutter bees. I was more then happy to encourage him in his experiment. Leaf-cutter bees are important pollinators, are non-aggressive and rarely sting. Do you know what else leaf-cutter bees do? Like their name suggests, they cut circular sections out of leaves which they use to line their nests with. They then store a supply of pollen and nectar, lay eggs and then leave. Now my husband’s nest box is located right above my roses…. Guess what a leaf-cutter bee’s favorite type of leaf is? So, you see what my conundrum is? I will ask my husband if he wouldn’t mind moving his nest box elsewhere in the garden. That way my roses will not get too ‘holey’, I’ll still have pollinators in my garden and my husband still gets to have fun attracting leaf-cutter bees. I think that works, don’t you? Roses can handle a fair amount of activity from leaf-cutter bees, although too many holes will affect the health of your roses. Remember that it is leaves that make the ‘food’ for your plants. I don’t like to use pesticides if I can help it in the garden, but they wouldn’t help me against leaf-cutter bees. Since the bees don’t actually eat the leaves, the pesticide is useless. **More importantly, I don’t want to harm the bees, so I wouldn’t use pesticides against them, regardless. If you don’t want to see any holes in your rose leaves, you can cover them with cheesecloth or fine netting to keep the leaf-cutter bees away (as people who exhibit their roses in shows do).